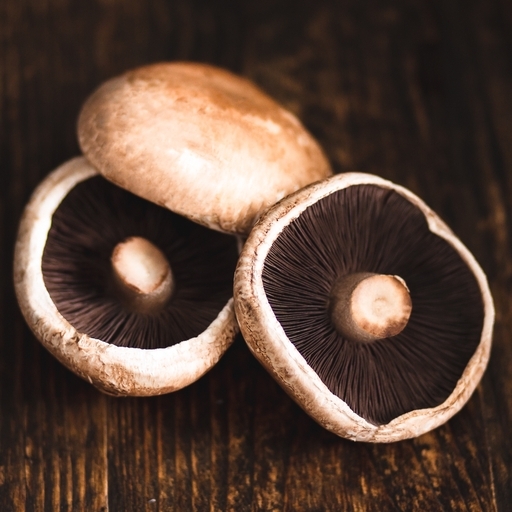 These organic portobello mushrooms are handsome and hardy, with a firm, meaty texture. If you want to stuff mushrooms, this large variety works best. They’ve got a fantastic earthy flavour too, as they’re essentially giant chestnut mushrooms. Portobellos come into their own baked or grilled, and make a fantastic alternative to burgers for vegetarians – just brush with oil, then grill or barbecue. Grilled portobellos are also an ideal vehicle for creamy poached eggs. Eat with a pile of just-wilted spinach for a vegetarian breakfast or a quick dinner. If you’ve got time, try this with a handful of juicy roasted cherry tomatoes. Keep in fridge and eat within a few days. Specialists grow mushrooms all year round in the UK. Grown in the United Kingdom. Chestnut is the tastiest small variety of mushroom. For grilling, BBQing and stuffing, Portobello have a wonderful meaty quality. Many of our mushrooms come from The Organic Mushroom Company. They’re mushroom experts and know just what they’re doing. Mushrooms take 5 weeks to grow, then they have 3 weeks’ worth of harvesting time. The team then clears out the tunnels, ploughs the compost back into the fields (it makes a fantastic soil conditioner) and the cycle begins again.